The General Atomics MQ-1 Predator is an unmanned aerial vehicle (UAV) which the United States Air Force (USAF) describes as a MALE (medium-altitude, long-endurance) UAV system. It can serve in a reconnaissance role and fire two AGM-114 Hellfire missiles. The aircraft, in use since 1995, has seen combat over Afghanistan, Pakistan, Bosnia, Serbia, Iraq, and Yemen. The MQ-1 Predator is a system, not just an aircraft. The fully operational system consists of four air vehicles (with sensors), a ground control station (GCS), and a Predator primary satellite link communication suite. The U.S. Air Force considers the Predator unmanned aircraft system (UAS) a "Tier II" vehicle. 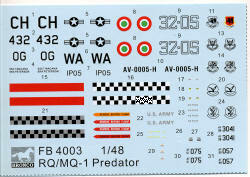 The Predator system was initially designated the RQ-1 Predator. The "R" is the Department of Defense designation for reconnaissance and the "Q" refers to an unmanned aircraft system. The "1" describes it as being the first of a series of aircraft systems built for unmanned reconnaissance. 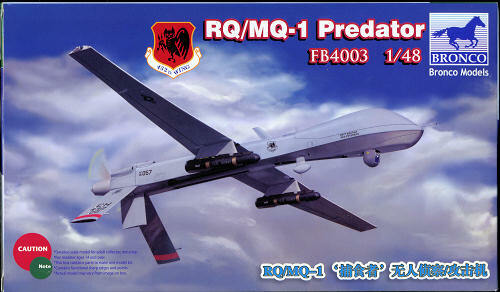 Pre-production systems were designated as RQ-1A, while the RQ-1B (not to be confused with the RQ-1 Predator B, which became the MQ-9 Reaper) denotes the baseline production configuration. It should be emphasized that these are designations of the system as a unit. The actual aircraft themselves were designated RQ-1K for pre-production models, and RQ-1L for production models. In 2005, the USAF officially changed the designation to MQ-1 (the "M" designates multi-role) to reflect its growing use as an armed aircraft. The RQ-1 Predator drone became the primary unmanned aerial vehicle used for offensive operations in Afghanistan and the Pakistani tribal areas. Its endurance is such that it can fly 400 nautical miles to a target, loiter overhead for 14 hours, then return to its base. US generals testifying before the United States Congress in November-December 2009 about the new Afghanistan strategy declined to discuss the issue of Predator-launched missile strikes in public. The program was supposed to be classified. They discussed their appreciation for the intelligence and reconnaissance-gathering abilities of UAVs. Operators include 1115 Flight RAF, 32 Stormo of the Italian Air Force as well as two ANG units; the 111RS (which used to fly F-16s) Texas ANG and the 196 RS (which was a KC-135R squadron) California ANG. Undoubtedly the two ANG units lost a huge number of pilots and maintainers but I bet the admin load is the same. Turkey is also getting a half dozen of these aircraft though the unit is as of yet unknown. This is the second Predator kit produced in injected plastic of which I am aware. 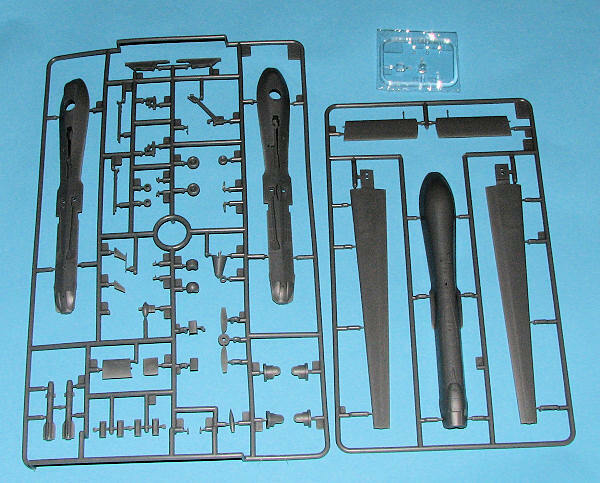 Prior to this there was at least one resin kit and there is the 1/72 kit by Accurate Miniatures. Molded in two grey and one clear sprue, there sure doesn't seem to be a lot for your $40 but the parts are very nicely molded. There really isn't all that much to the kit. There are two optional builds, which is why there are two lower fuselage halves. One of them has a large blade antenna in between the main landing gear so there is a large mount on the one half. The other doesn't. Looking at photos in the reference, it seems most do not have this. But it could be a recent addition. There are also optional FLIR pods, upper fuselage antennas and different engine cooling scoops. Typical of Bronco, there is no indication of which aircraft had which parts and looking at the decal and painting guide is useless as they all show the same configuration. One thing that is new is that it provides color information f or small bits in the instructions. For armament, a pair of Hellfire missiles and pylons is included. There is no cockpit detail as there is no cockpit. Instructions now include paint references, something missing from the last Bronco kit I previewed. There are markings for four aircraft. Two of them are from Nellis AFB; one with the WA tail code. The other US plane is from the 432 OG, and there is one Italian aircraft. The US planes are in overall FS 36375 while the Italian one shows that one adds white (though not how much) to this same color. Decals are nicely printed and include remove before flight tags to put on thin pieces of aluminum or lead, though it would have been nice to have both sides of the tag for this. I'm sure this will appeal to those who are into things a bit off the beaten track. I think it is a very nicely done kit that should build into an equally nice model.